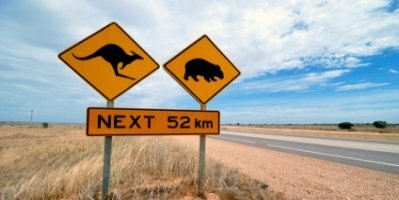 There are some things you need to know about driving in Australia if you're travelling from overseas and you're going take some time and do a bit of a road trip. Firstly in Australia we drive on the left-hand side of the road, so if you come from a country that also drives on the left it will probably be a lot easier for you but if you come from a country that drives on the right-hand side of the road it may take a bit of getting used to. About 66% of people in the world live in countries that drive on the right-hand side of the road and aroung 34% live in countries that drive on the left. 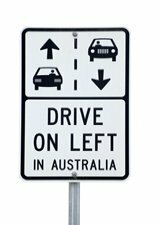 If you come from a country that drives on the right it might be handy to print out the Drive On Left Sticker that's on this page and put it in a visible spot in the car while you're driving in Australia. And because we drive on the left in Australia that means the steering wheel and the pedals are on the right side of the vehicle. 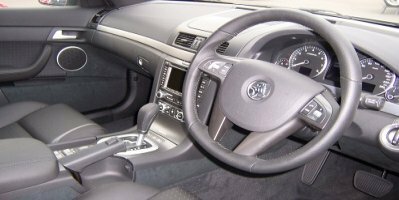 The pedals are still in the same position, so you use your left foot for the clutch (if the car's not an automatic, of course) and your right foot for the accelerator and brake. But you will have to get used to shifting gears with the left hand instead of the right and the wipers and indicators are on the opposite side as well. Essentially everything is on the other side but it shouldn't take you too long to get it... Don't forget that we drive on the left mate because if you do you might have to get off the road real bloody quick! Secondly if you're going to be driving in Australia you'll need to know the road rules and regulations. The road rules are fairly consistent but there can be little differences from state to state and the requirements for international drivers might be a little different too. 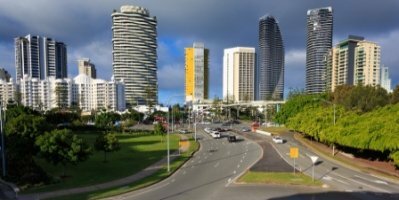 You can check out this Australian Government Page for more information about the requirements in the different states and territories. All states have speed detection and red light cameras and the fines if you get caught speeding or running a red light are pretty high so you're better off not doing it. Seat belts and the correct child restraints are compulsory, front and back seat, in all states and territories when driving in Australia. You can find out more from the Baby Center here. Australian speeds are in kilometres per hour not miles per hour. The roads are generally well signed to show speed limits in most places I've been. You can work out the conversion with the kilometres to miles converter below. In the cities the limit is normally 60 to 80 kmh on most main roads, residential back streets are 50 kmh except in the Northern Territory which is still 60 kmh. Open highway limits are 100 to 110 kilometres per hour. When first driving in Australia the distances are quite often a surprise to people from other countries, Australia is a big place and the distances between the Capital Cities can be a bit of a shock for some tourists. I remember a few years ago when I lived in Queensland one of my friends had family coming from Scotland (for the first time) and they decided they would fly into Sydney and take a nice "little" trip up to Brisbane, they got to Brisbane and couldn't believe it took them over 10 hours; of course we all thought that was pretty funny because we didn't even think about it and just presumed they realised how far it was. These are the distances between the Australian Capital Cities, of course you will get slight differences in the quoted distances from everywhere you look because there are different routes you can take so everyone gives you slightly different answers but essentially, give or take a few kilometres here and there, that is it and as you can see you can spend hours driving in Australia. If you want to find the distance or the directions for driving in Australia from one place to another just type your start point and where you want to go into the calculator below and another window will open up to show you how to get there and how far it is. There are drink driving rules that are strictly enforced in all states and territories of Australia. We have Random Breath Testing (RBT's) units that can be set up at anytime or anywhere. The limit is 0 for learner drivers and motorcyclists, provisional drivers, bus and taxi drivers, truck drivers and vehicles carrying dangerous goods, for all other drivers it is 0.05%. Most states now also test for drug use while driving too. And the police don't need a reason to pull you over and get you to submit to a breath test in Australia, if you're on the road and the RBT is there you can be pulled up and tested, oh and don't try to turn off the road to avoid them because they generally have cars or bikes waiting for just that and they'll chase you and make you take the test anyway. We have commercials that tell you "if you drink and drive you are a bloody idiot and you will get caught". The roads in most capital cities are in fairly good condition and so are the highways between the capitals. Once you get outback a bit things can get a little bit dodgier with the road conditions depending on where you're going. You can check out our page on Australian Outback Travel for things you need to know before travelling in the Australian Outback. Kangaroos and other animals can be on the roads when you are driving in the country especially at dawn and dusk which is usually when they feed. And if it's possible don't drive at night because they are much harder to see and they can get dazed by the headlights but if you can't avoid it keep an eye out for them (get your passengers to keep an eye out too)and slow down, believe me you don't want to hit a roo or any other Aussie critter. So you're going to need a car to do all of this driving in Australia. Now I suppose you could buy one but why not just hire one for the time you're here, it takes all the guess work out of what sort of car you need to buy and whether you need to get insurance and how to go about that and so on, if you just hire one it will make your time here so much easier. You can get prices on Car Hire right here. Or if an RV is more your style you can check out all the information you need to know right here too with CamperTravel. Have a great time driving in Australia, and we'll leave you with this last thing. If you are doing long trips make sure to rest every couple of hours, take a break, stretch your legs, have a water, a cup of coffee or tea and something to eat and if you do get tired or fatigued stop and have a sleep. You'll see these signs all along the highways here.... Stop, Revive, Survive! That's good advice, it's just not worth it, you'll get there and when you do you'll be glad you had a rest and you'll enjoy yourself more. Happy driving and maybe we'll see you on the road.